This truck would park in pedestrian walkways, the police would even take down the plastic barriers to let this truck park, right in the middle of Times Square. Twice I complained, because I could not get through the crowd and it was getting to be a bother everytime I went to the bank, this truck was there, blocking my access to move around quickly. First of all it is not right for any charity, real or not real to setup shop right in Times Square without permits. Second of all, the police have no right to just decide to allow this. The two times I spoke up, I always got some rude cop who told me to mind my business. The second time, I asked the cop to check if they had permits, the cop told me not to tell him how to do his job and told me to move along. When I continued to insist that this truck should not be parked there, that it was parked in pedestrian walkways, impairing me from doing my errands, I was told I was blocking the people and to move along or else. Angry pedestrians were yelling at me to mind my business and one called me heartless. I knew something was up. The whole thing did not look right. But our dumb cops that patrol Times Square, were too busy hanging out, talking on their cell phones and even helping these alleged scam artists, by not questioning them about permits, or asking for any documentation that they were indeed a real charity. Some cops posed for photos with these men. Suppose a truck loaded with bombs was decorated like this truck. The Police Department would just have allowed this truck to park, with no questions. As a resident of Times Square, I have every right to question anything, but the NYPD seems to think that they have to answer to no one in this neighborhood. They seem to think that I have no right to question activities here. It would be very interesting for the Police Department to start reviewing the video footage from dozens of cameras in Times Square. They could see that their cops went out of their way to allow this alleged scam. 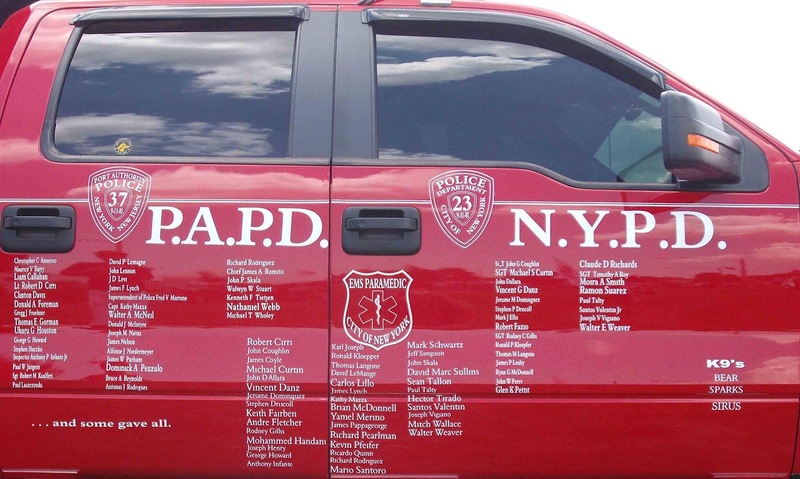 The cops questioned no one, just because this truck was decorated with 9/11 names. How stupid are the cops they are stationing in Times Square. I think you know the answer!